Should colleges consider race in admissions? A major battle over the use of race in college admissions may be headed for the U.S. Supreme Court. Unsuccessful white applicants to the University of Michigan's undergraduate college and law school are challenging policies that give an advantage to minority applicants. The university says the policies are needed to ensure racial and ethnic diversity on campus. A federal judge approved the current undergraduate admissions policy, but another judge struck down the law school's system. A federal appeals court will hear the two cases in October. 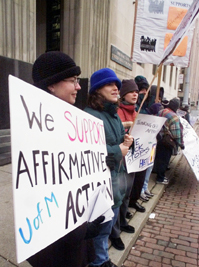 Both sides say the cases may reach the Supreme Court, which has not examined the issue since the famous Bakke decision in 1978 barred racial quotas but allowed colleges to consider race as one factor in admissions.